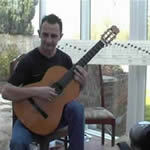 Learn classical guitar with this Guitar Tuition DVD. This DVD covers the essentials needed for classical guitar playing. Presented in an entertaining way, this informative DVD will help you understand the fundamentals of classical guitar playing and will teach you the basic skills that will enable you to develop your playing further.